Our parents teach us many life lessons as we grow up. They teach us how to share, how to use a knife, how to act in public, how to cook, clean, and pick up our rooms. These are all important lessons, we will carry them with us throughout our lives and use them daily. But one of the most important lessons they could ever teach us, and that we could ever pass on to our children, is good oral hygiene. Maintaining good oral hygiene is important. And it all starts when we are children. If we learn good dental habits during our childhood, we are more likely to carry those lessons with us through our lives. This means that kids who learn about good oral hygiene are more likely to maintain their dental health as adults. Learning by example is a great way for kids to adopt habits. Seeing parents brush, floss, and take care of their teeth will encourage children to do the same. But it may take more work than that. How are you supposed to teach your children oral hygiene lessons that they will live by? Granite Family Dentistry can help. Follow these tips when teaching your child about good oral hygiene, and hopefully these lessons will stick with them rather than the plaque! Kids aren’t going to want to stand there, watching themselves in the mirror, brushing their teeth. So make it fun for them! Talk to them about the importance of brushing on each side of their teeth, how long they should brush for, and how to properly brush. That is not the fun part, but it is good to lay down some fundamentals of good teeth brushing. Now the fun part—make brushing a fun activity for your children. Toothbrush companies offer fun brushes for kids, with cartoon characters from their favorite TV shows and movies. Let them pick one out so that they get excited to use it. If you want to get really serious about it, find an electric cartoon toothbrush. There are some companies that make electric brushes for kids that sing a song during the two minutes they should be brushing. This will keep them on track with how long they should brush for, and be fun for them. But you can also make it fun for your kids without a singing electric toothbrush. While they are brushing, play a song, sing a song, or anything else that helps them enjoy their brushing time. Just make sure they don’t get too into the song and forget to brush their teeth properly! Kids are very reward-oriented, meaning they will do their chores, pick up their room, and brush their teeth if they are rewarded for their actions. Set up a system that allows you to reward your children for doing a good job brushing their teeth. This could be a sticker system, getting them a new toy, or letting them watch 15 extra minutes of TV for the night. Whatever your child loves, add to that. 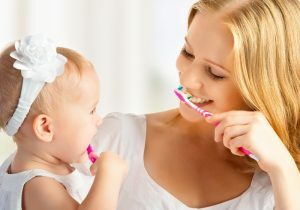 Getting your child excited about brushing their teeth can be easier if they know they are doing it for a reason. They don’t care, yet, that their teeth and gums may get diseases from bad oral hygiene, but they do care about missing an episode of Spongebob. To make sure this system works, you will have to watch them as they brush, making sure they are cleaning their teeth as good as possible. This will ensure that they don’t lie just to get their reward. Like mentioned earlier in this blog, children learn good habits from watching you. So why not brush your teeth together? 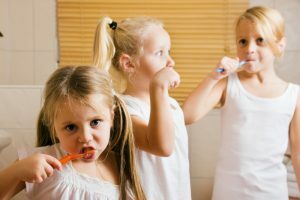 Having the whole family brush their teeth together will help them mimic the techniques you use to brush your own teeth, which may cause them to brush their teeth properly. This way you can also make sure they aren’t skipped any important steps, aren’t cutting their time short, and aren’t just chewing on their brush. When dentists ask if you have been flossing, we know you haven’t. Flossing is just as important as brushing, yet many people skip this step in oral hygiene. Teach your children to floss at a young age, it will help them, hopefully, adopt the routine and continue it as an adult. Flossing with string floss can be difficult for children, so get them those hand held flossers that come in different colors. It will not only make flossing easier but the colors will make it a little more fun for them. And while you are at it, floss your own teeth to show them the ropes! Dentists are scary for children too. But taking your kids to the dentist regularly can help them get used to it. Plus, it helps keep their teeth clean and ensures that their are no problems with their oral hygiene! So be sure to schedule regular teeth cleanings for your kiddos at Granite Family Dentistry. Getting your kids to learn about oral hygiene and brush their teeth properly can be a challenge, but it is extremely important to teach them young so they take care of their teeth throughout their adulthood. 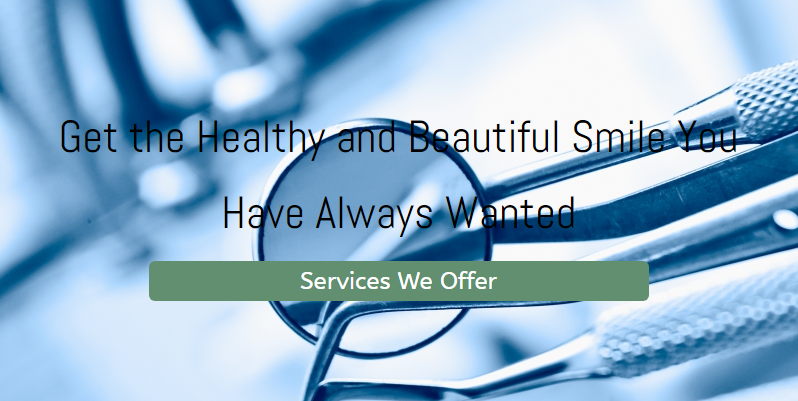 Schedule your child’s teeth cleaning at Granite Family Dentistry now, contact us today!